Over the easter weekend I got to visit Palawan for the first time! I absolutely loved it there. Such a pristine place and not too commercialized. As we planned nothing else but to stay on the beach and do beach stuff, here’s all the makeup I brought. 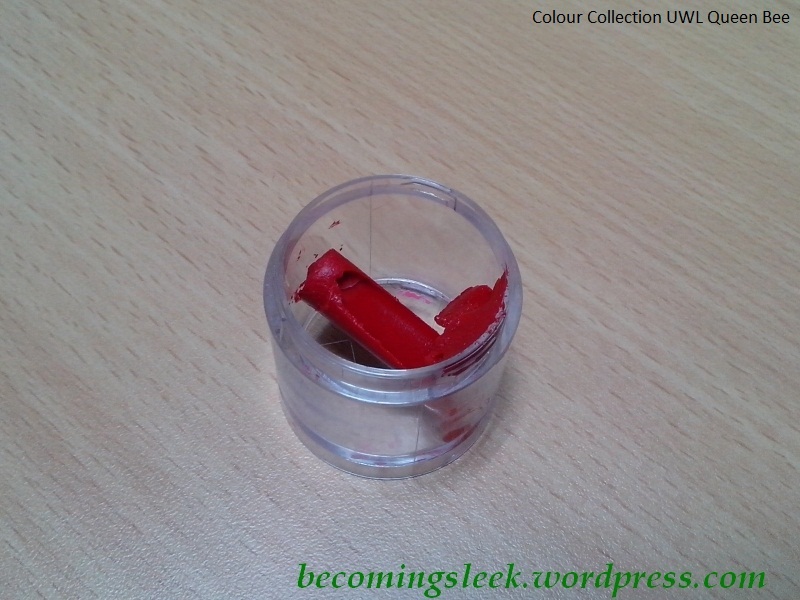 Pixy UV Whitening Two-Way Cake – the only base I brought. I figured I didn’t really need a lot of options, but I definitely wanted to bring one with SPF. I actually hit pan on this already! I’m just also using it up before I buy a refill. 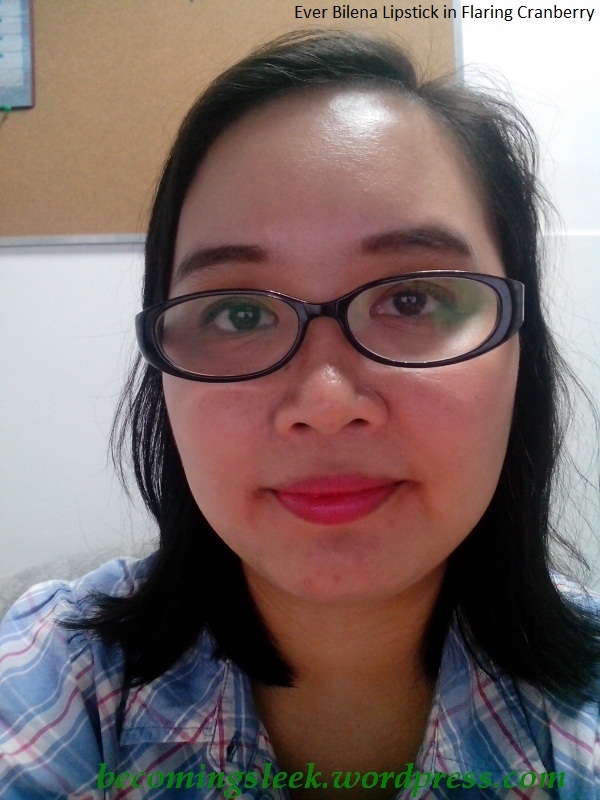 Colourpop Super Shock Eyeshadow in Smash – it’s really the most abused base color I use in my stash, and it definitely went into my kit. 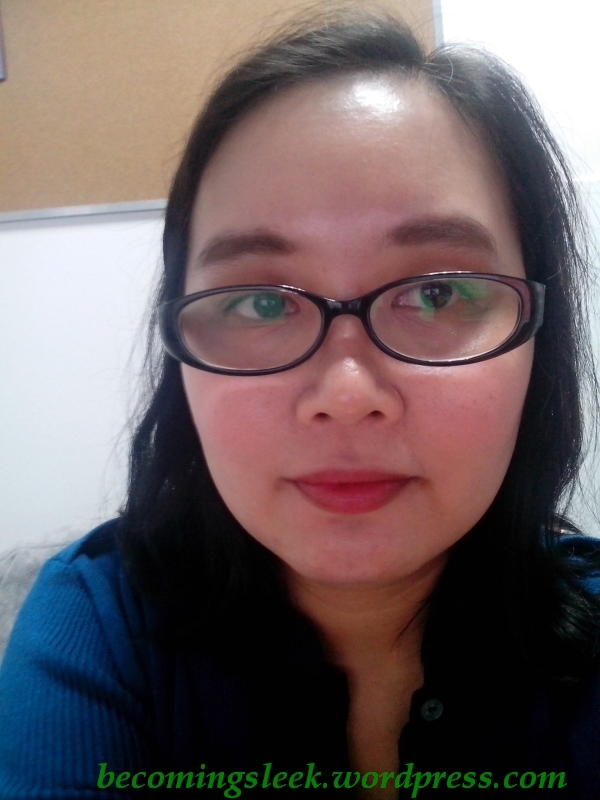 Pixy Eyeshadow in 01 Romantic Poem – I just brought this along for pops of color, and the fact that it’s quite small and it has a tiny sponge applicator. 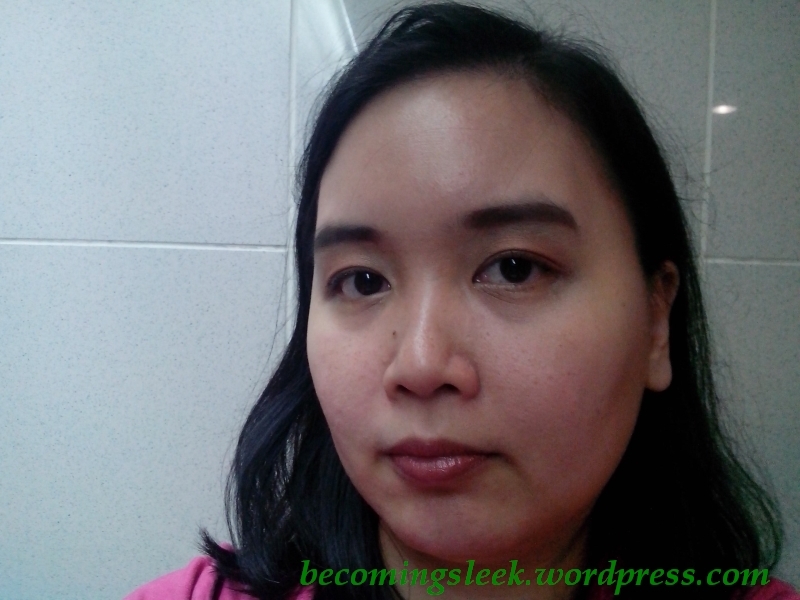 Pixy Blush On in 02 Brown Tea – Again same reasoning as the eyeshadow, being compact and comes with its own tiny brush. 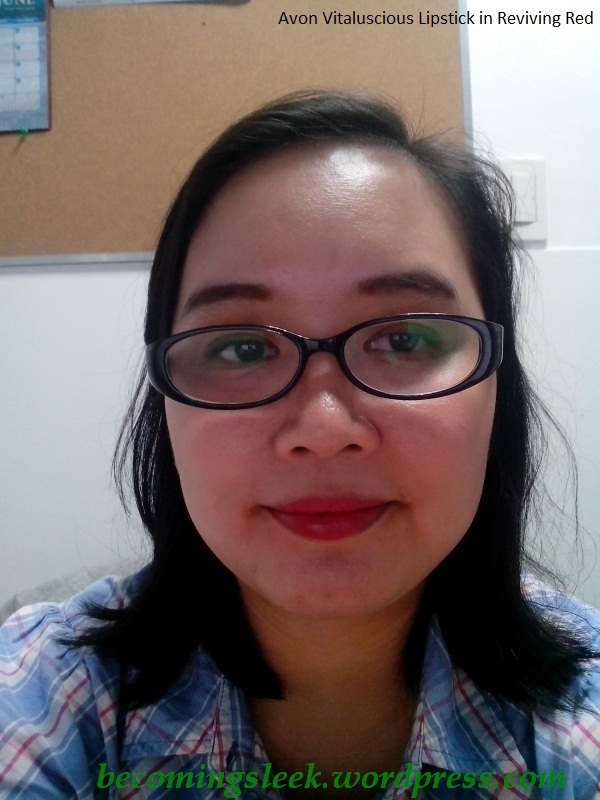 I also like that it’s a brown shade instead of the usual pinks and reds, perfect for the beach! Happy Skin Eye Love View Eyebrow Duo – Among my eyebrow products this claimed to be waterproof (which you’ll actually see in action below!). It also comes with a marker side, in case I really wanted a very polished look. 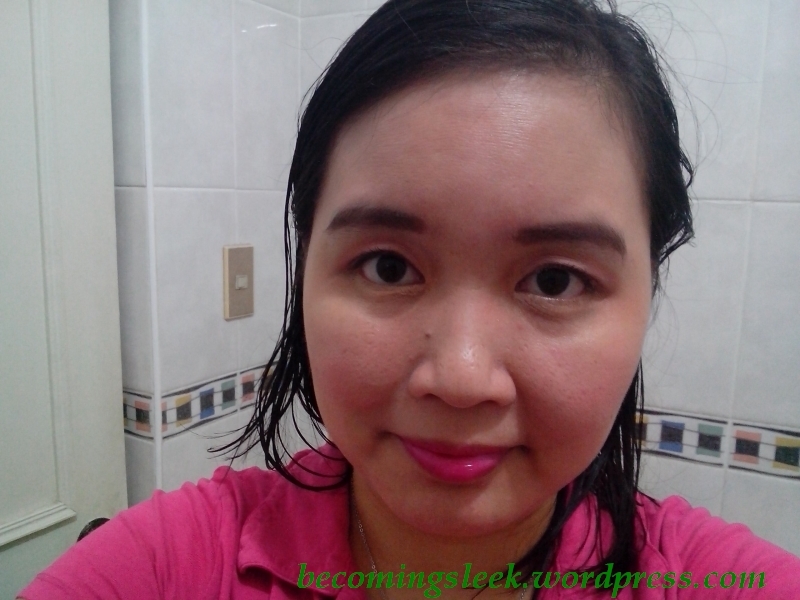 Fairydrops Platinum Mascara – I brought this for the waterproof factor, and the fact that this is on its last legs and I’m just using it up. Will be sad to see this go, as I can no longer replace this locally. 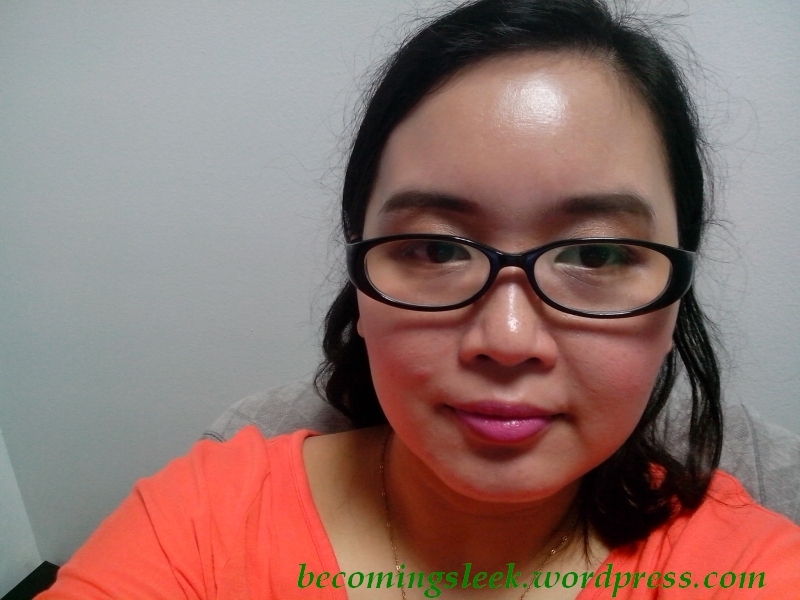 Burt’s Bees Tinted Lip Balm in Honeysuckle – My recent go-to lip balm, which never leaves my purse anyway. 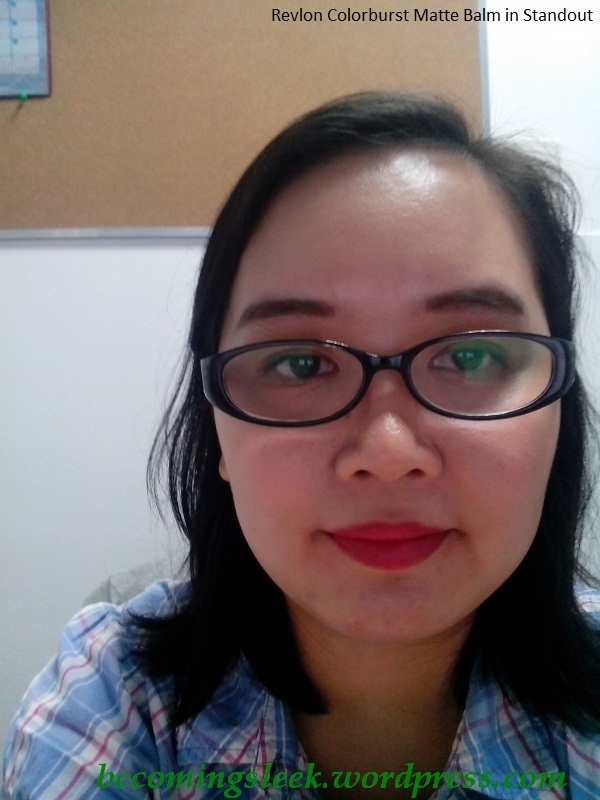 Colour Collection Ultimate Wear Lipstick in Bellissima – The only red lipstick I brought (learned my lesson from my last trip haha!). Which, ironically, wasn’t used on the trip! 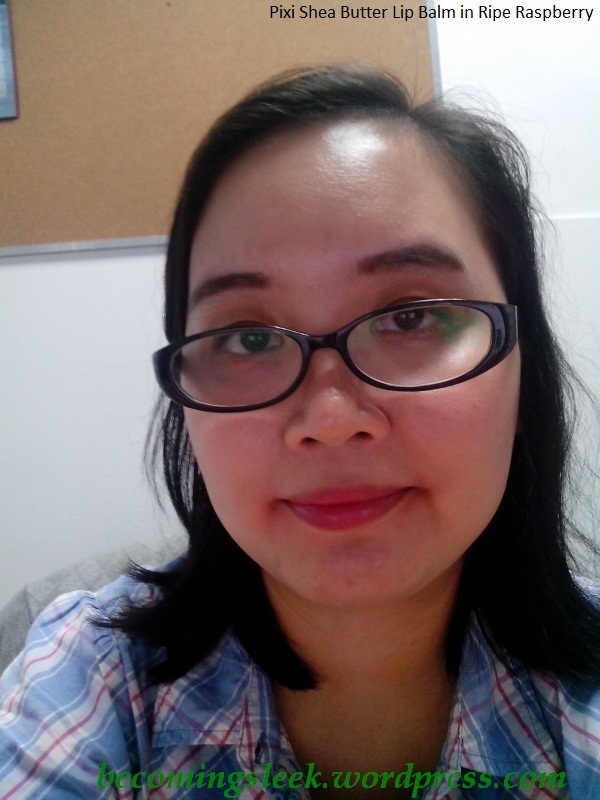 Ofra Lipstick in #205 (not pictured) – And the only pink lipstick I brought. 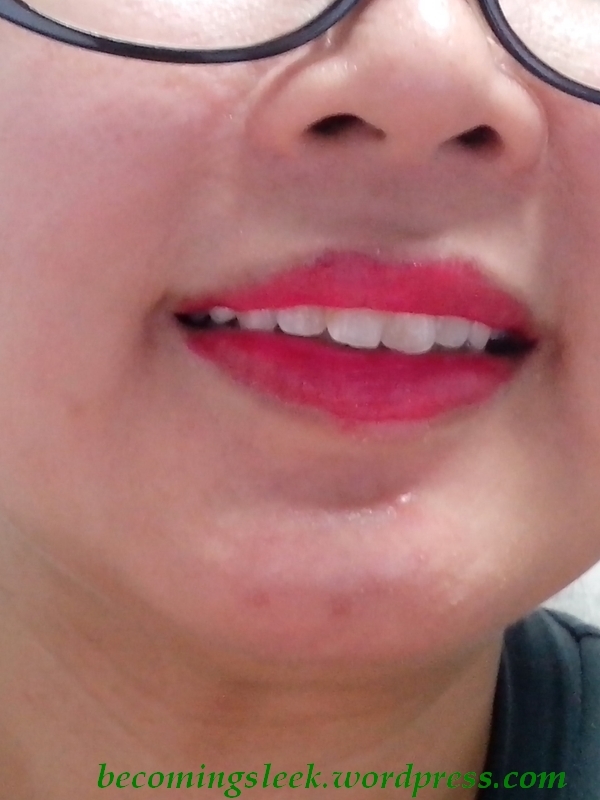 This one was used more because I didn’t really feel like using red lipstick on the beach. All of these were packed in an old small Clinique pouch that was probably a GWP somewhere. 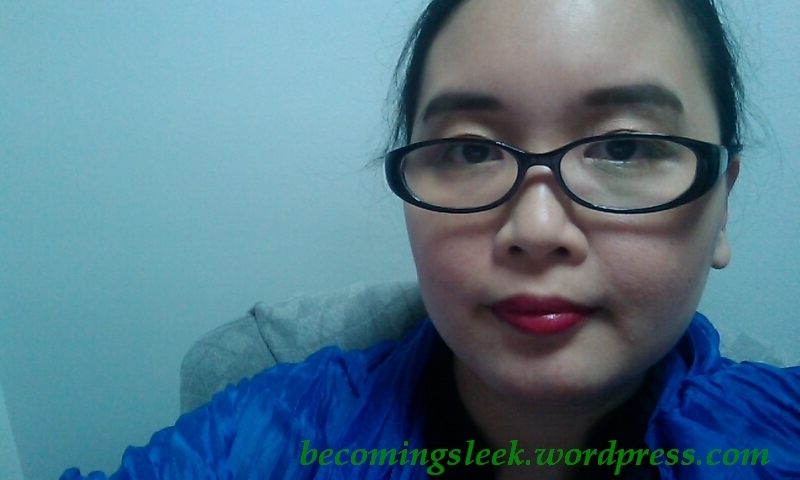 I liked that I brought very little makeup here, which matched exactly the use I wanted out of them. It also helped keep my packing light! How are all of you, post-Glenda? I’m very lucky in that, aside from the metro-wide blackout, my family has been mostly unaffected. The tree in front of my house got uprooted and almost hit my car. With the help of some neighbors we were able to upright it back in place, with some rope. I was able to spend a lot of extra time with my daughter since she had no school for almost the entire week. 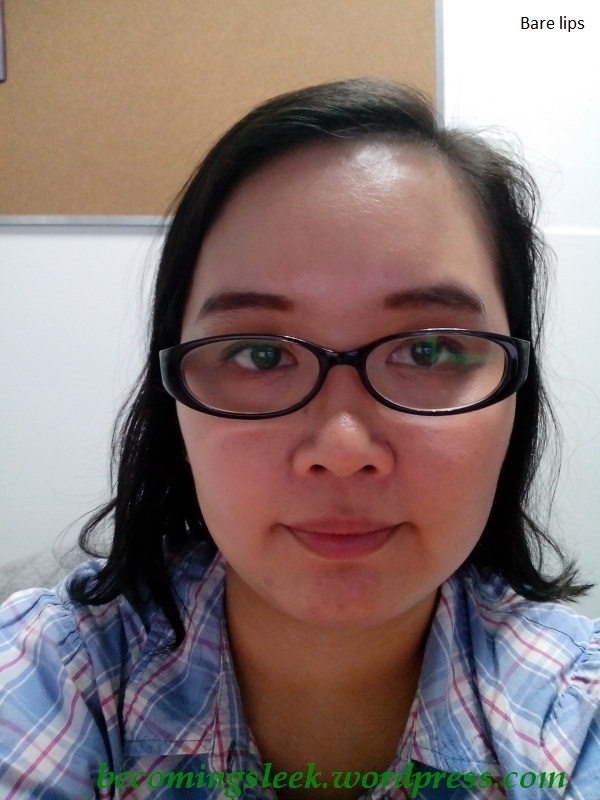 I was also unable to blog because of a lot of work-related stuff, but hopefully I’ll get back in the groove soon! 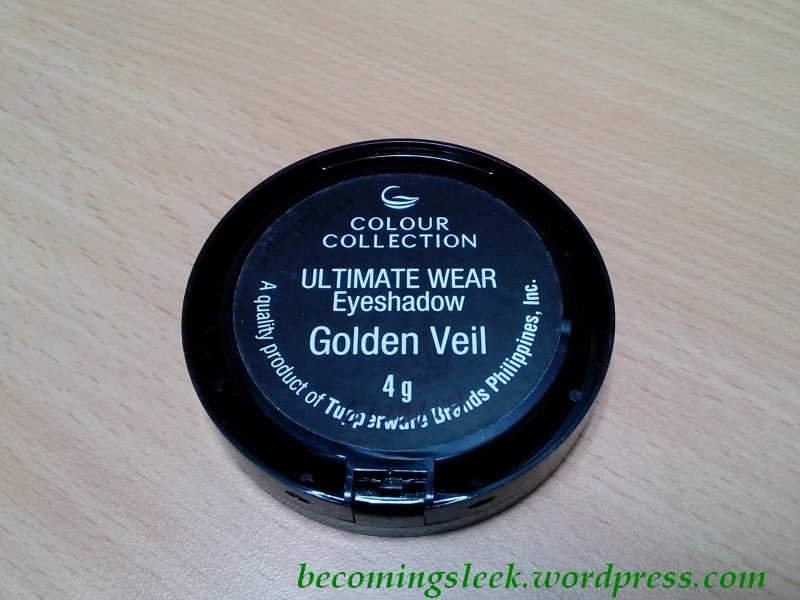 I received this Colour Collection Ultimate Wear Eyeshadow in Golden Veil as part of the prize pack in The Beauty Junkee’s 5th Anniversary giveaway (I was also able to meet Martha!). 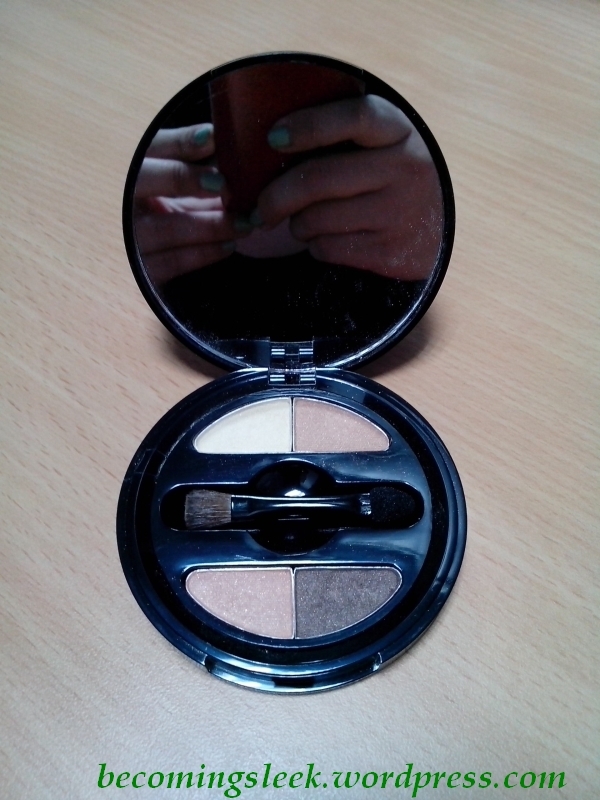 It’s one of my most anticipated products in the pack, naturally as it is a neutral eyeshadow palette. 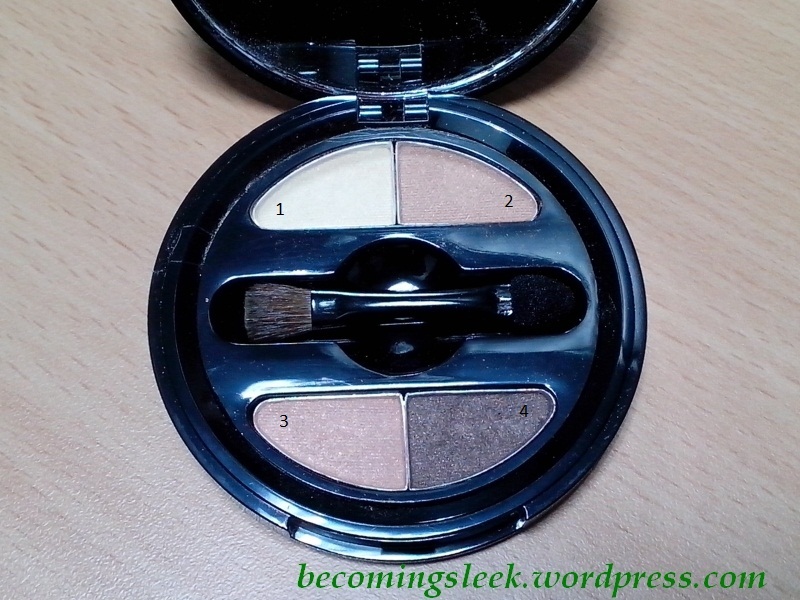 It is a round compact that is relatively large for a 4-shadow palette. It’s as big as the palm of my hand. 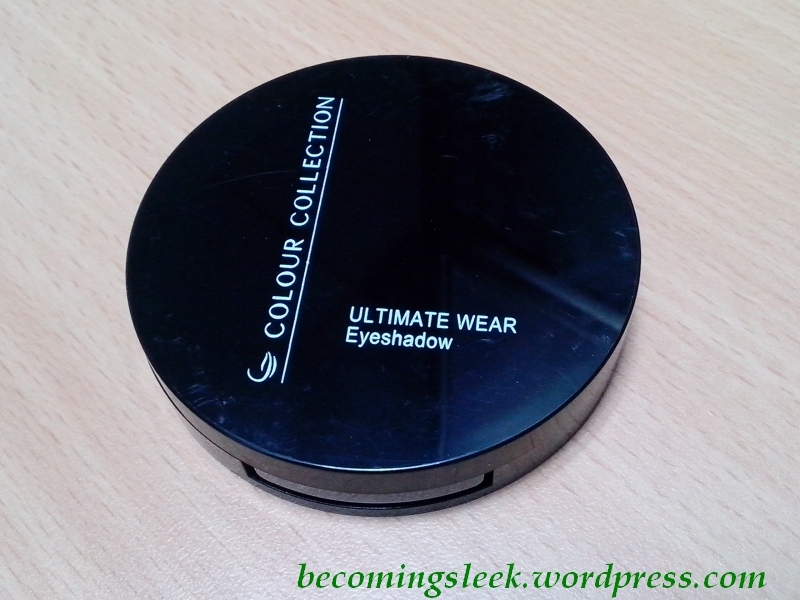 I like the compact because even if it’s made of plastic, it feels durable and yet light. 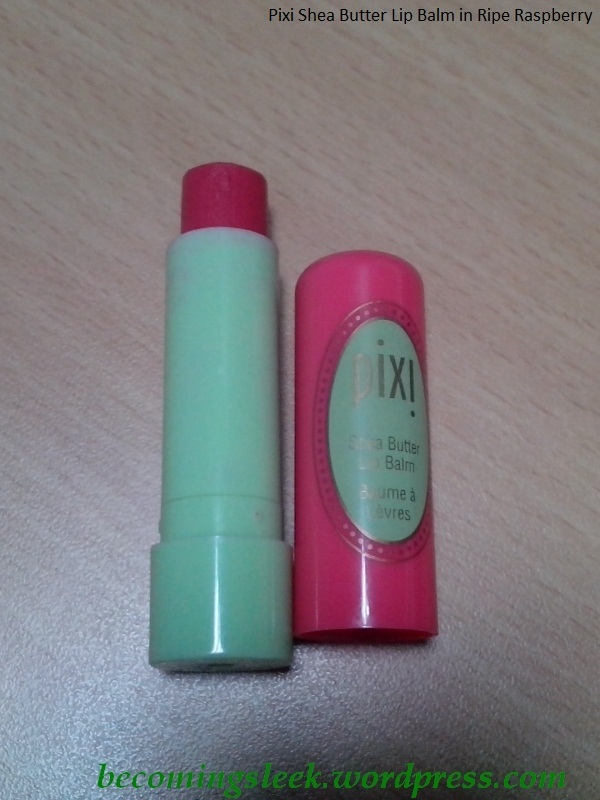 The finish though is not very good; it attracts a lot of dirt and fingerprints. It should be easy to clean with a damp cloth. On the back you’ll see the compact name, Golden Veil, and that it contains 4 grams of product. 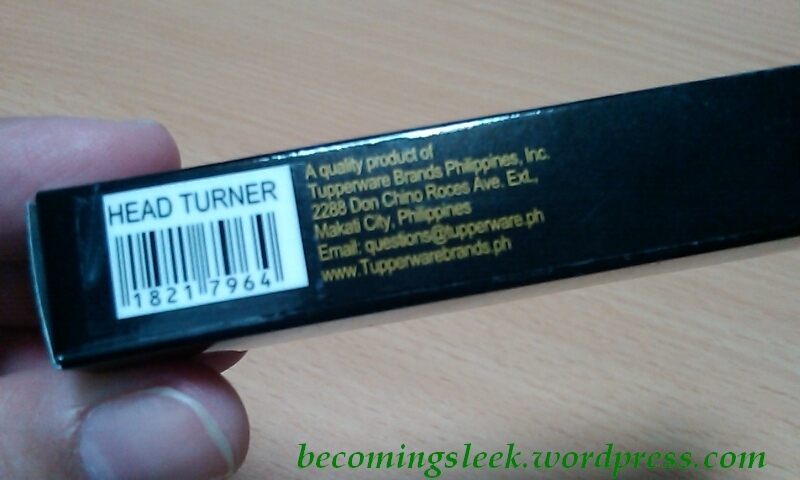 It also indicates that it’s a product of Tupperware Brands Philippines, Inc. Upon opening you will be greeted by one of the highlights of this palette: the humongous mirror. It comprises the entire underneath of the lid! It’s a really good-sized mirror, and is one of the major reasons why I like bringing this compact around. You’ll also see the actual shadows themselves, which are housed in these tiny pans. It also comes with a double-sided brush, a foam applicator on one end and a shading brush on the other. 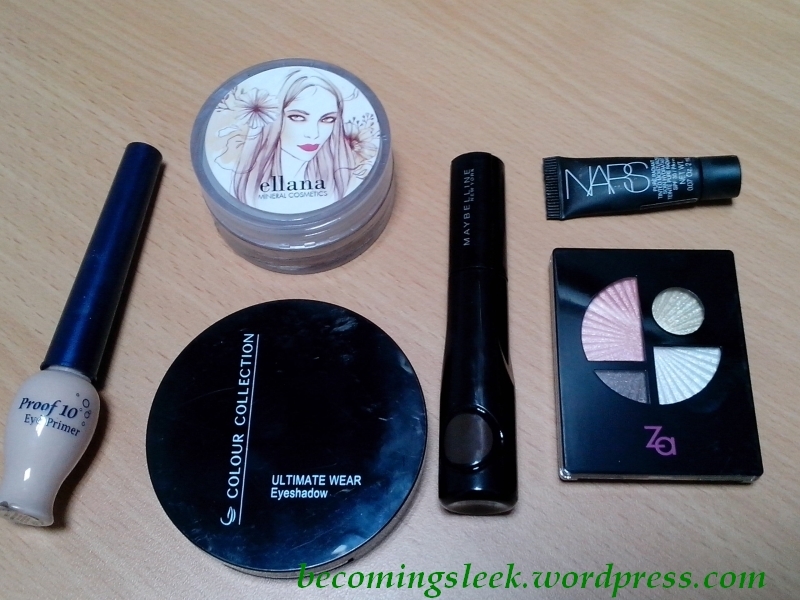 I’ve never used this, preferring my full-sized brushes for eyeshadow application. Here is a close up of the palette. 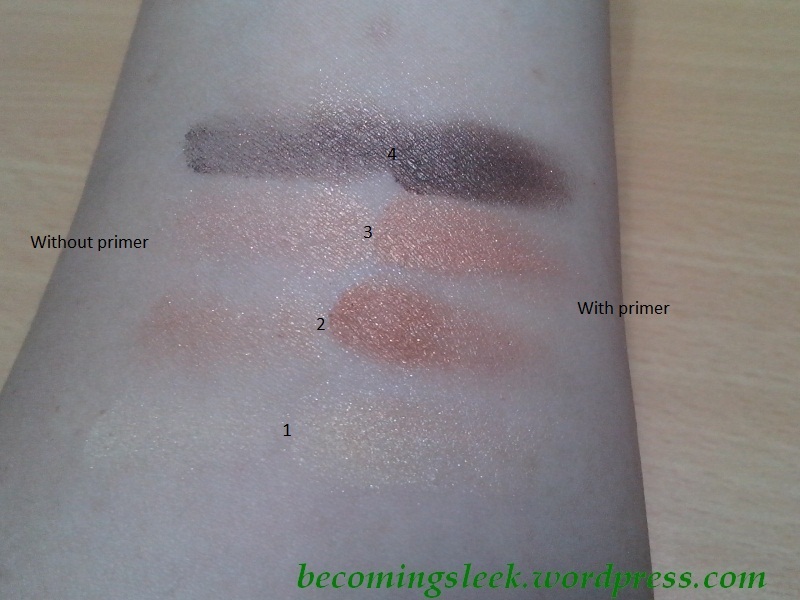 I’ve labeled the shadows so that it’s easier to reference it with the swatches below. 1 is a highlight shade, a very light gold. 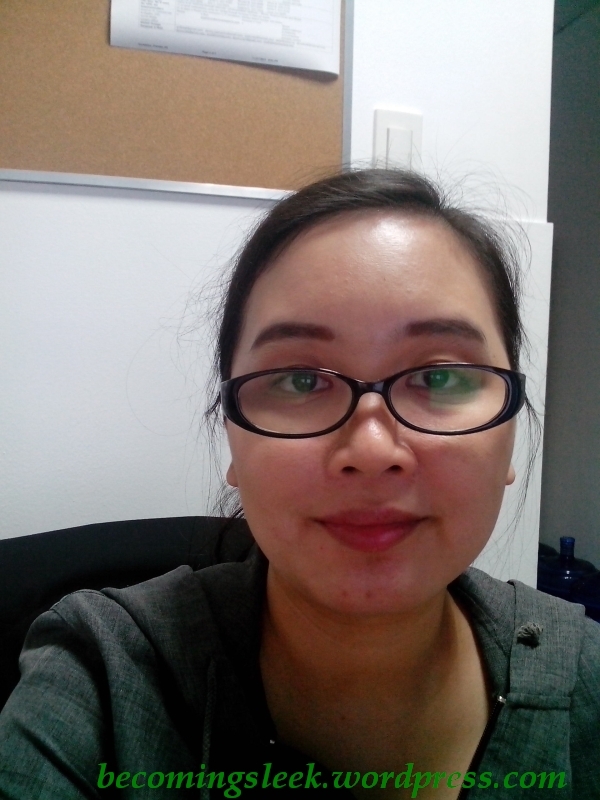 It’s almost invisible against my skin without primer. 2 is a copper, the redness of which comes out pretty nicely with primer. 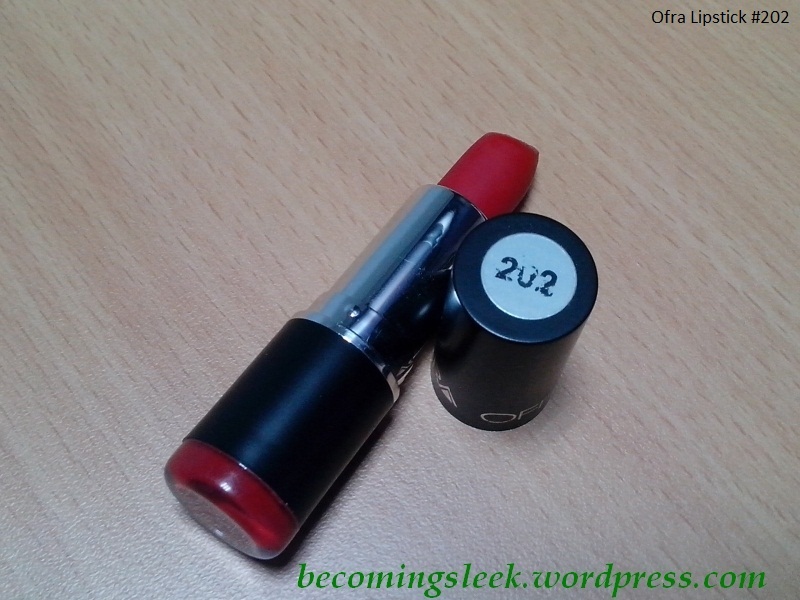 3 is a rose gold peachy shade which is quite similar to 2. 4 is a grayish brown, almost black especially with primer. 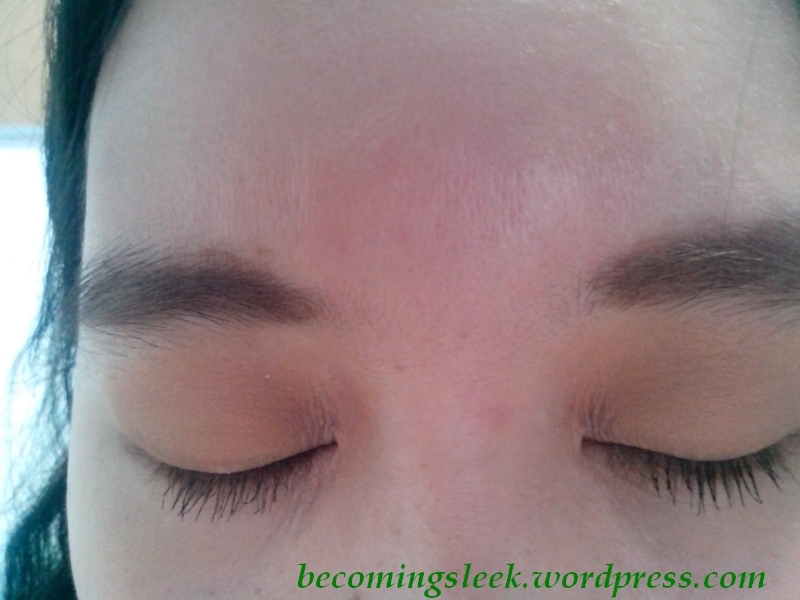 The primer I used here is Artdeco Eyeshadow Base. I really like the colors of this palette. 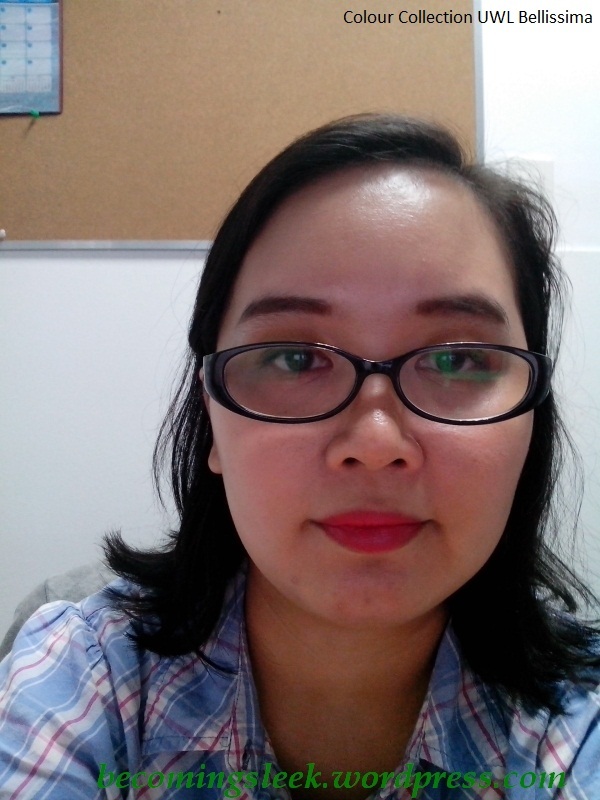 As a bonus, 4 can be used for the brows! I’ve used that as eyebrow powder here, as well as 1 and 2 for the lids. 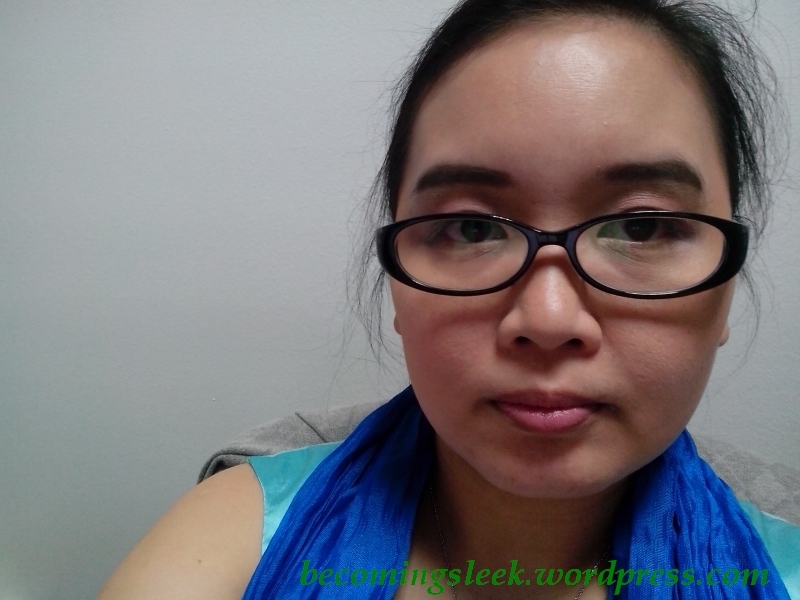 Here is a close up of the brows and the eye makeup. 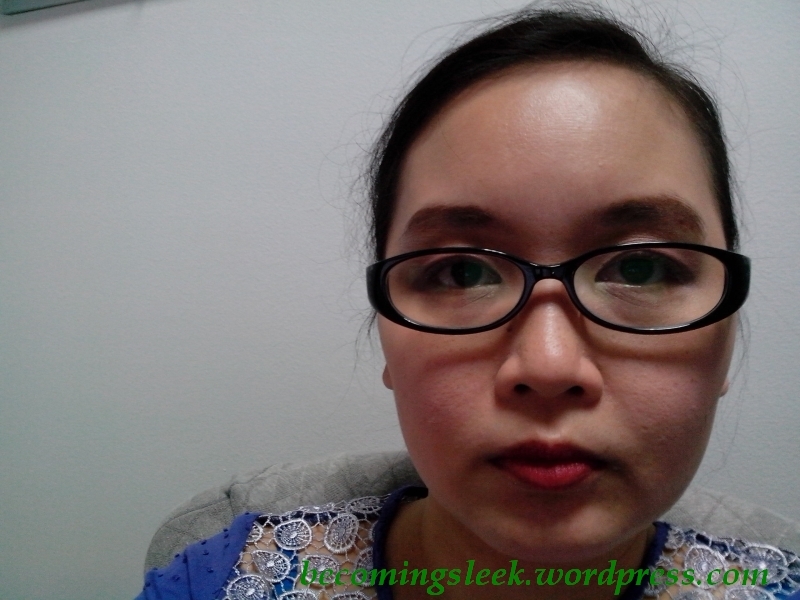 The shimmers don’t really translate well, which is definitely a good thing since it appears to be quite matte. 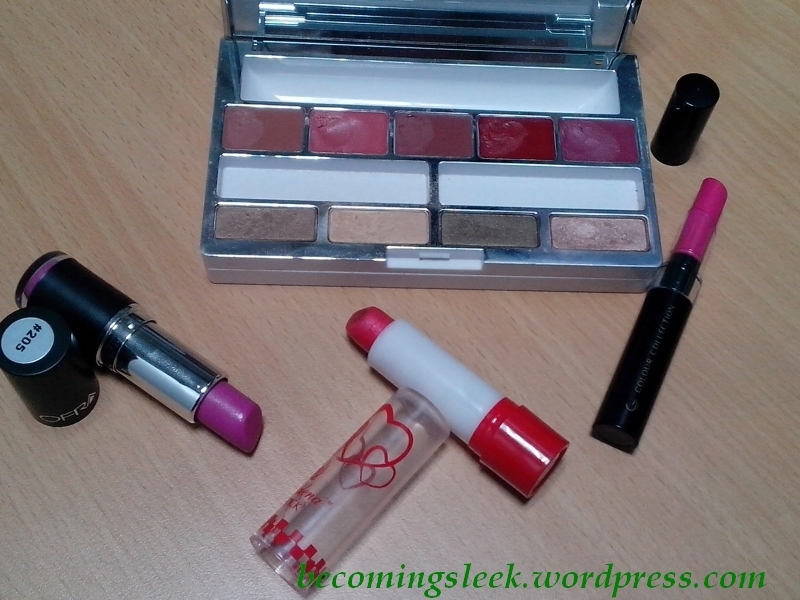 This makes the palette very work-appropriate! I don’t have information about Colour Collection’s stance on animal testing. I also could not find any price information about this specific product. 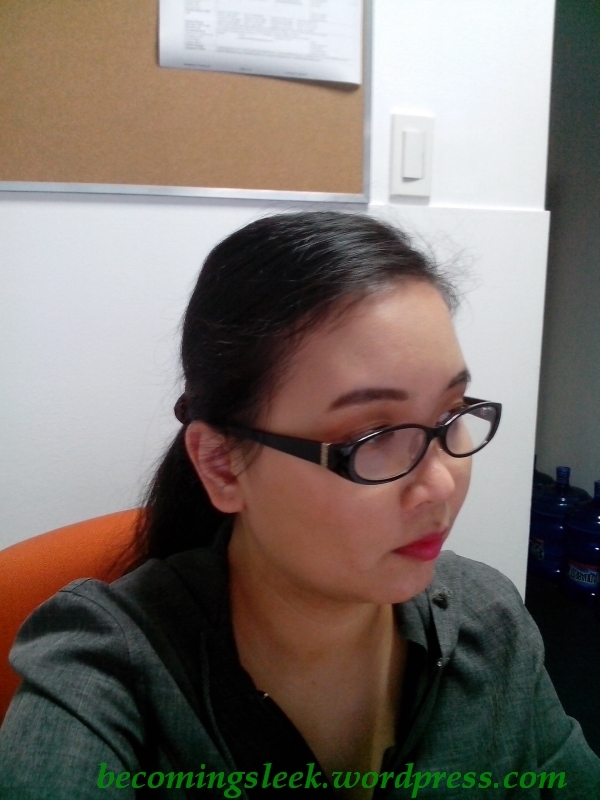 For reference, their eyeshadow trios cost Php380 SRP (Php279 in their current brochure). Colour Collection can be bought from dealers, which you can find here. No, you didn’t accidentally stumble on a book blog or an internet horror novel. But let me tell you what happened to me recently. As a back story, I have a very small pouch in my normal everyday bag that holds my touch-up items (face powder, lipsticks/balms, perfume). If I didn’t have enough time to do my makeup in the morning, I’d throw what I wanted to use for the day in a separate makeup bag so I can do the rest of my face when I get to the office. In an unrelated note, I have very poor memory and have learned to use different cues to help me remember things. 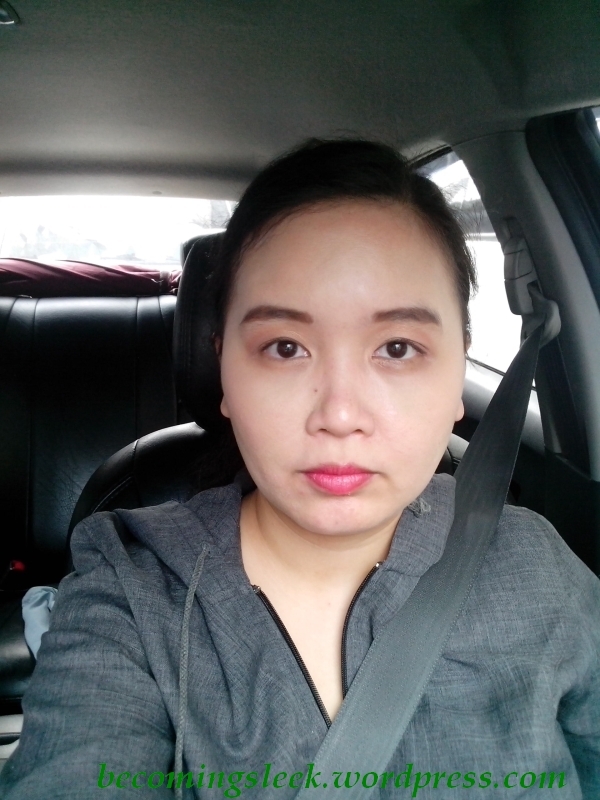 One day, I did the routine as usual, but I forgot to bring out my makeup bag with me from the car. 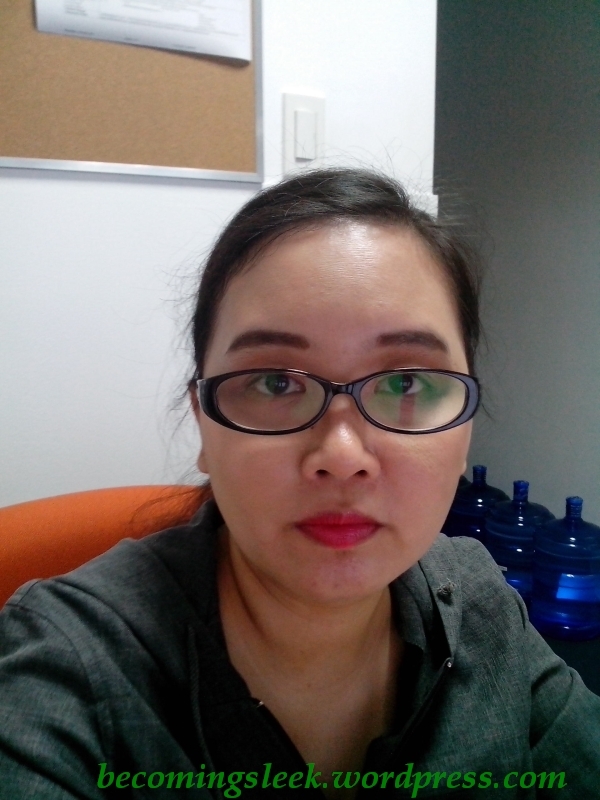 Now I usually have underground parking in the office so it would not be a big deal to forget my makeup in the car. That day, however, I parked above ground in a place with no shade. You can imagine what happened, in this heat we’re having recently. 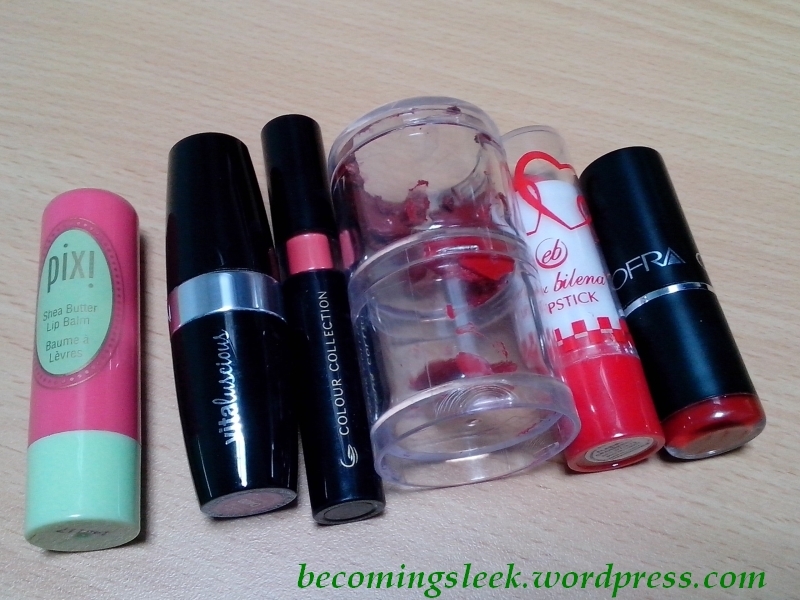 I had three of my favorite lipsticks in that bag, and they all came out of the bag badly damaged. I almost cried when I saw this! 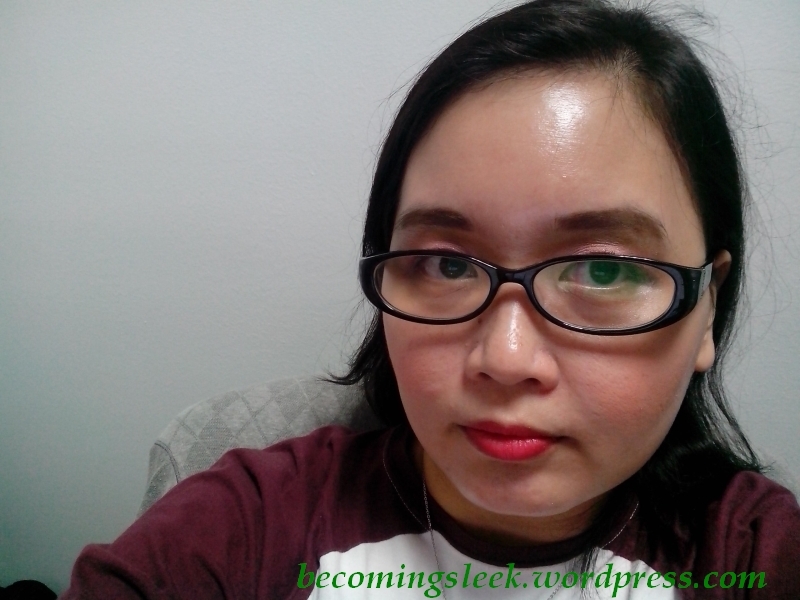 My first firsthand experience with melted lipsticks, and it was horrible! I hid them in a box at home for a couple of days because I couldn’t bear to see them like that. 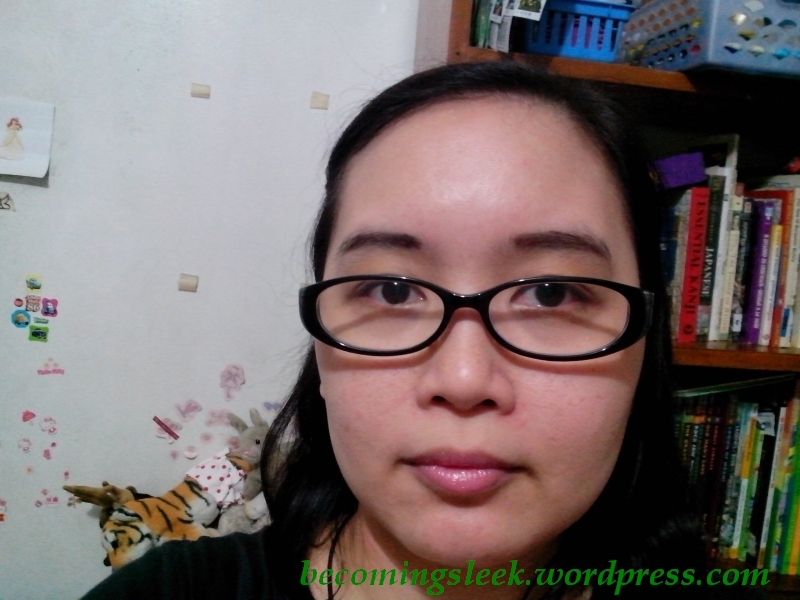 The next day, I squared my shoulders and examined the extent of the damage. 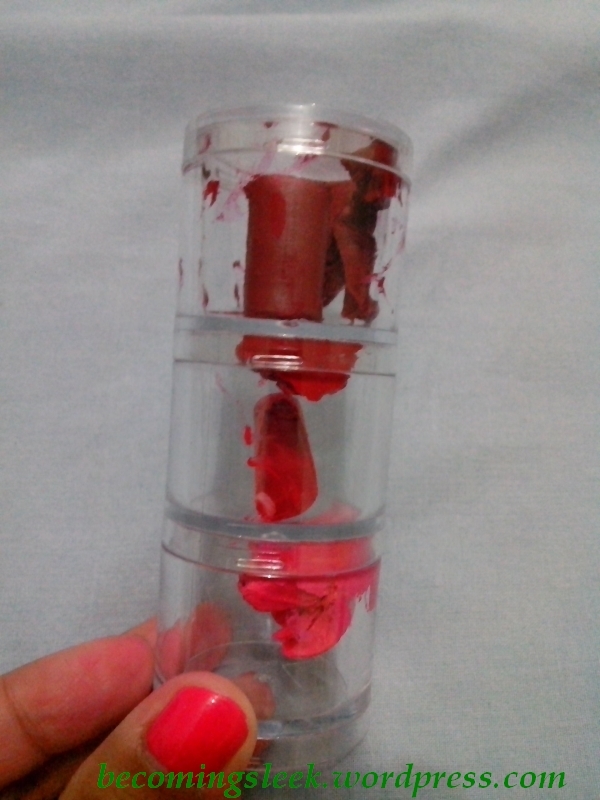 As I expected, they are all quite melted and reformed half in the original tube and half in the cap. 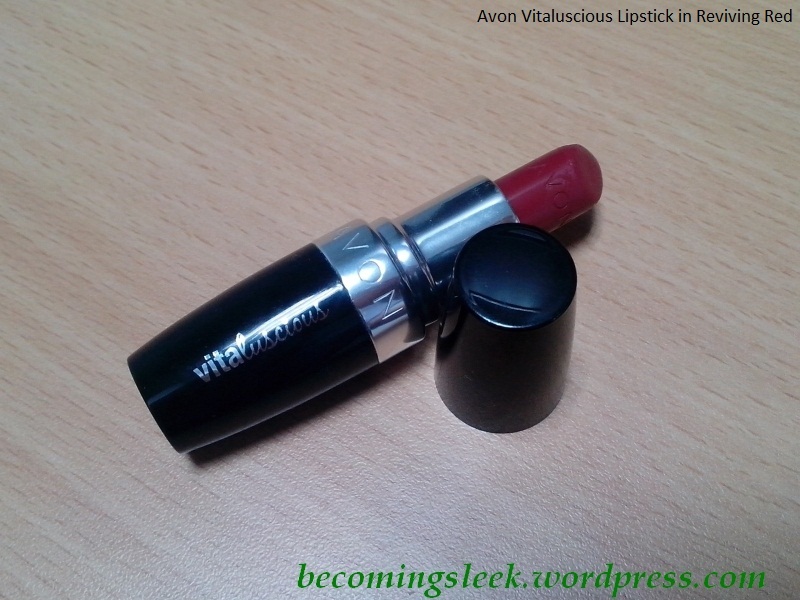 These lipsticks are: Revlon Colorburst Matte Balm in Standout (review), Colour Collection Ultimate Wear Lipstick in Queen Bee (review), and Avon Ultra Color Lipstick in Hibiscus (review). 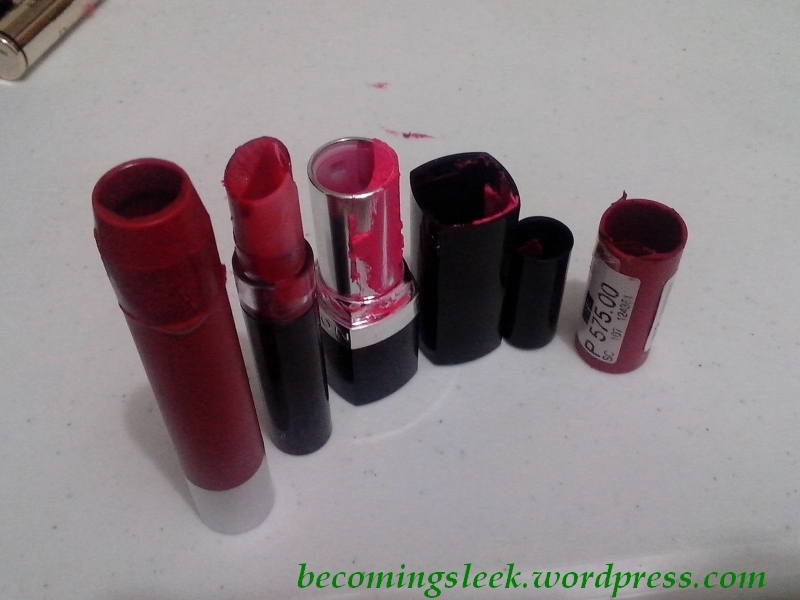 Bea advised to immediately depot these lipsticks to salvage them. I found a four-level screw-top plastic pots from Daiso Japan (formerly Saizen) and used three levels. It was a very sad and distressing task that I did not do prior research. I just basically scraped out the lipstick from the tube and the cap with a plastic spatula and shoved it into the plastic tubs. Here is how it turned out. It’s not as horrible as I imagined, but it’s also not elegant. I just realized that maybe I need to re-melt them so they will go down to the bottom of the tubs and not perched on the side like evil bloody pupae. Unfortunately I do not have a hair dryer, nor am I willing to take a lighter or anything flame near this thing, so it’ll have to do. 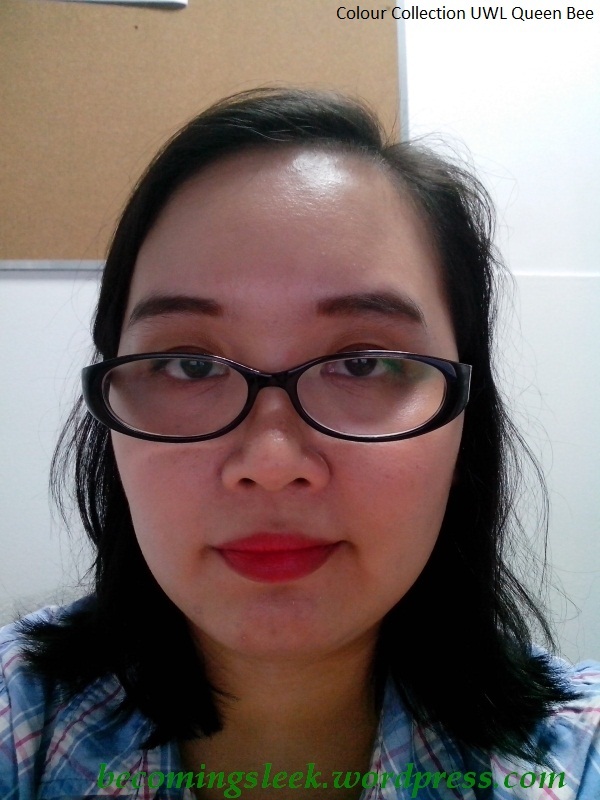 I did do a test run using a lip brush, and applied the Avon lipstick the next day. It seemed to apply as normal; the melting didn’t seem to affect the actual product. I hope the same is true for the other two. Has anything happened like this to you? I’d love to hear your product mishaps/accidents and how you dealt with it! 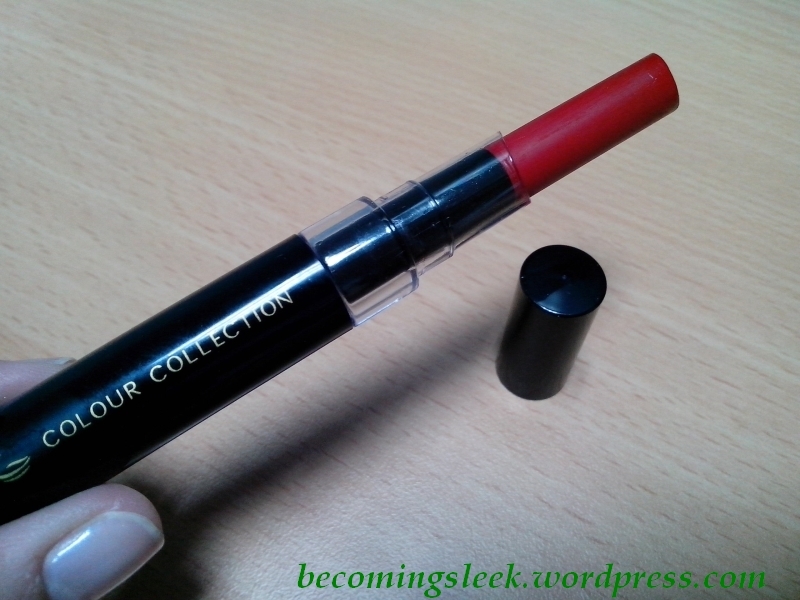 One of my new lipsticks I acquired recently is Colour Collection Ultimate Wear Lipstick in the shade Queen Bee. 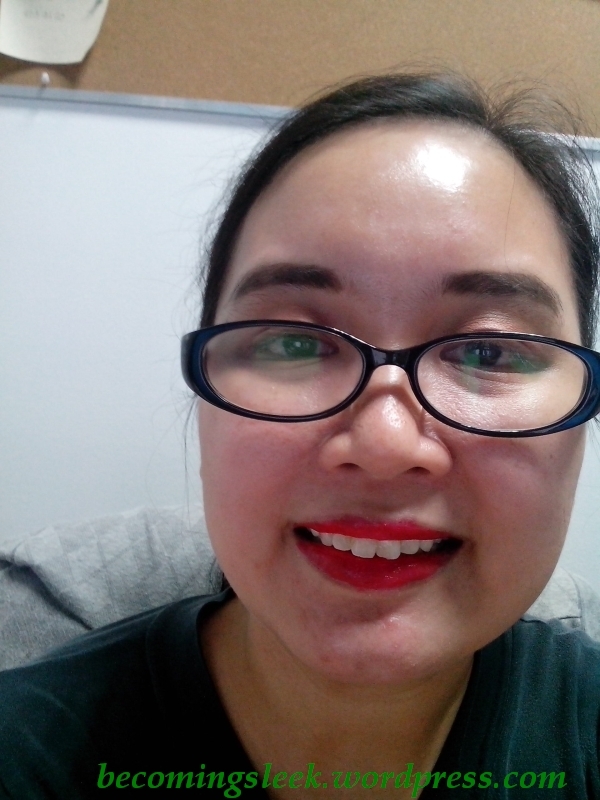 This is one of four lipsticks I own from that line (the other three being Naked Peach, Bellissima, and Headturner, swatched here). 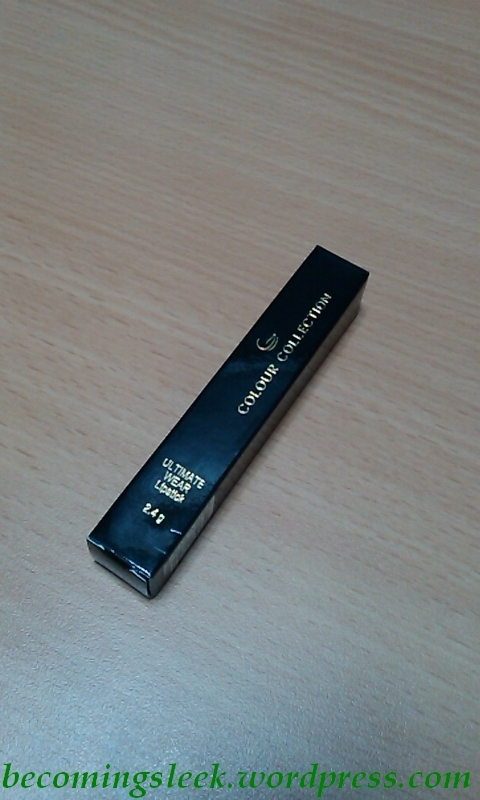 The lipstick came in a slender box, with the shade name printed on the side. Ingredients and other information are on the other sides of the box. This is Headturner’s box actually. 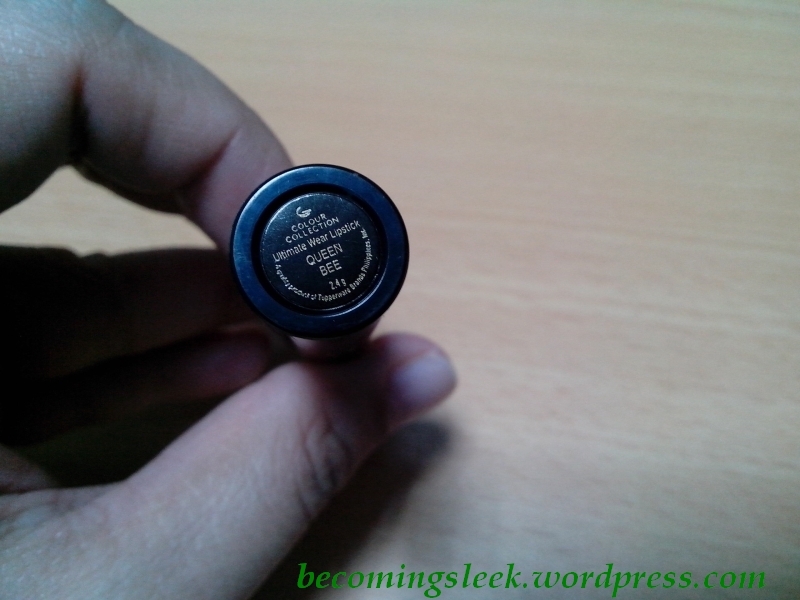 Queen Bee’s box is the same except the shade name. 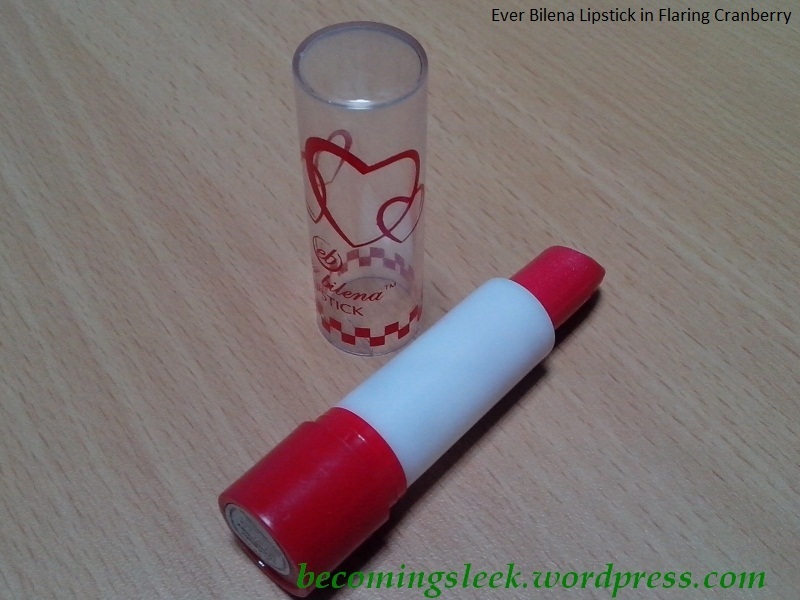 The lipstick tube itself is a sleek black plastic tube with a transparent viewing window in the middle. The brand name is printed in classy gold on the side. The shade name and product line is at the bottom. 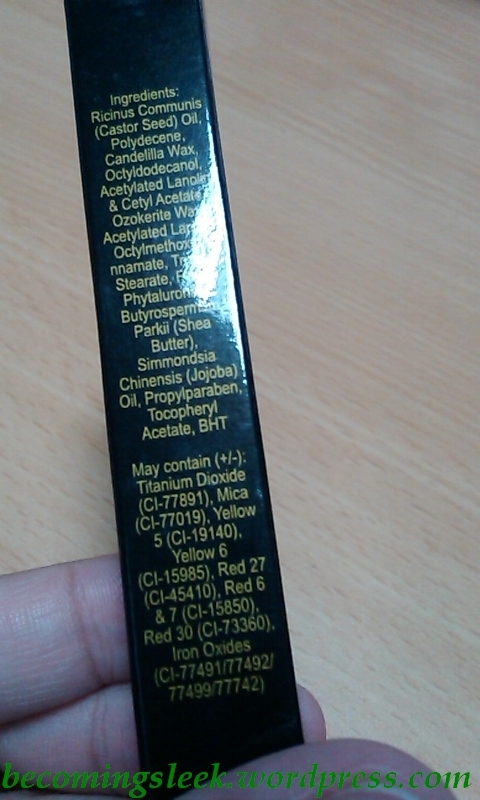 It also shows that this tube contains only 2.4 grams of product, which is much less than your standard lipstick tubes of 4 grams. Even so, there’s quite a lot of product in there! Another thing that I liked about the tube is that the product clicks on a locked position when withdrawing the product into the tube. No mess in your bag here! 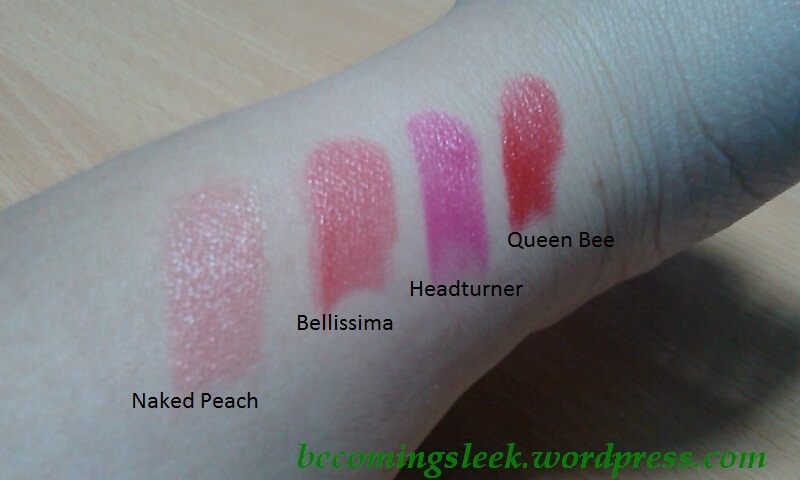 Here is the arm swatch I have of all four of my Ultimate Wear Lipsticks. Queen Bee is on the far right. 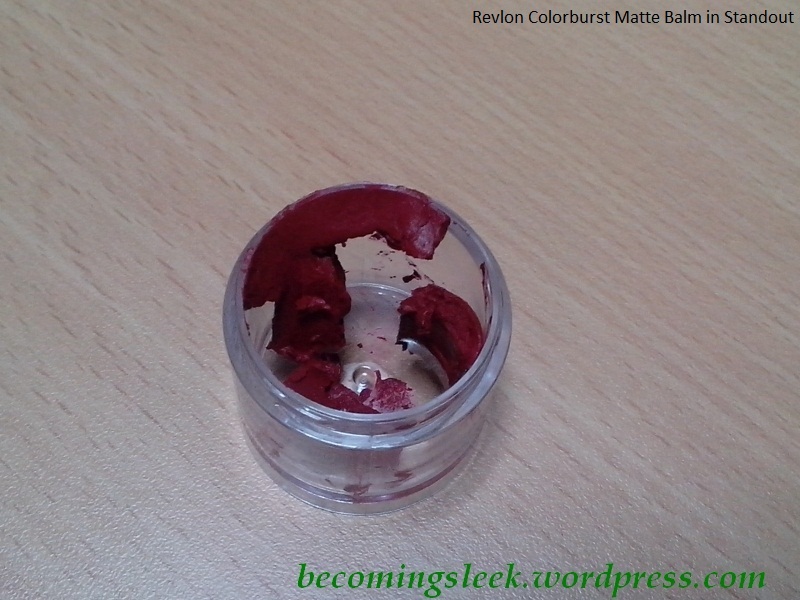 As you can see, Queen Bee is a pretty bright red even from just the arm swatch. 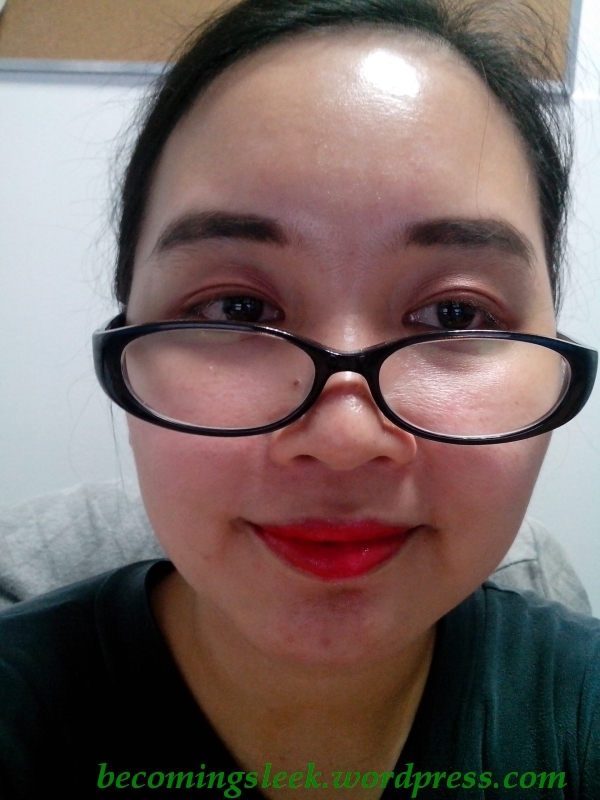 It translates to just as bright a red on the lips, which goes on glossy at first, and fades eventually into matte. 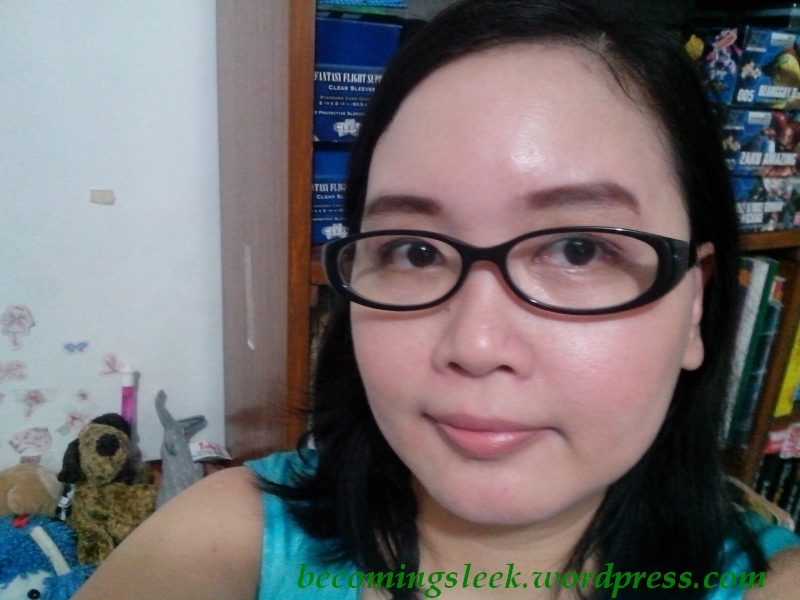 You can also hurry up the transformation into matte by blotting. 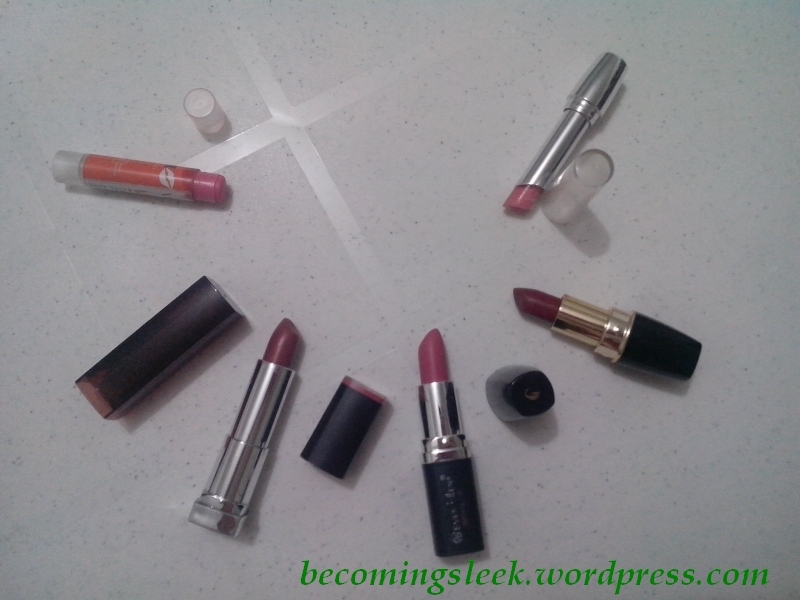 Here are a couple of lip swatches. And here are some looks I made using Queen Bee. I even tested the longevity and here it is after a few hours (maybe 4?) and a meal. Most of it has melted off, but it leaves a lovely stain that’s pretty even and doesn’t look patchy. I really like how bold and bright this shade is. 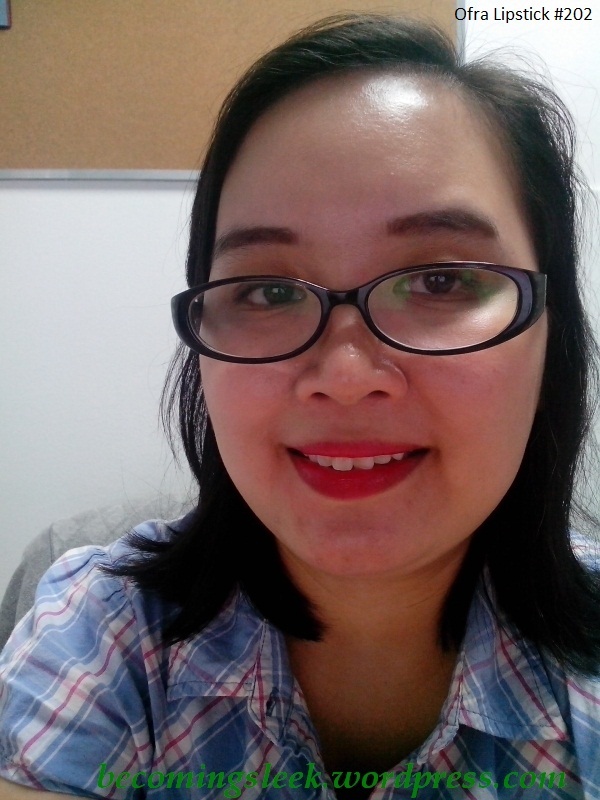 It lets me be quite the Queen Bee when I have it on, and gives me confidence to face any challenges at work and outside it. It suits my personality quite well, but at the same time pushes me to break my personal boundaries. 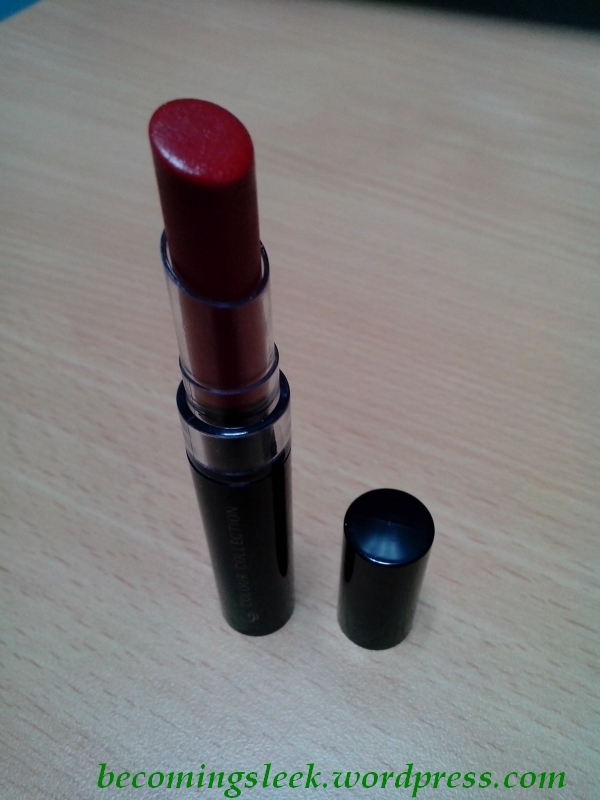 Ultimate Wear Lipsticks costs Php350 each. 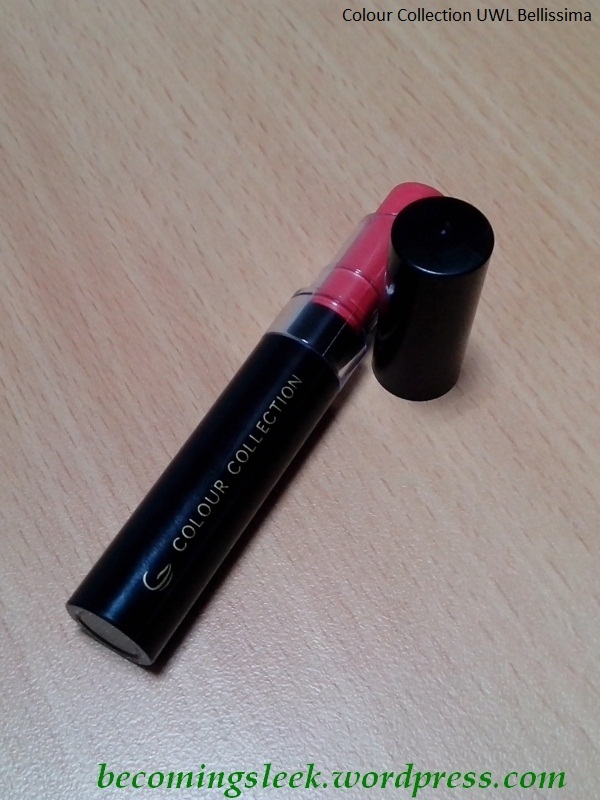 Colour Collection cosmetics can be bought from direct sellers. Some samples are available at Sampleroom. 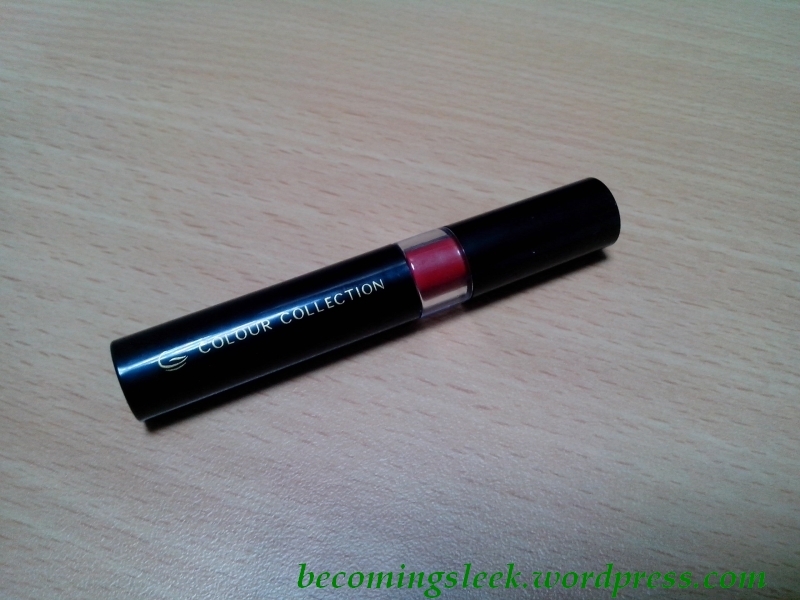 I have no information on Colour Collection’s animal testing policies.